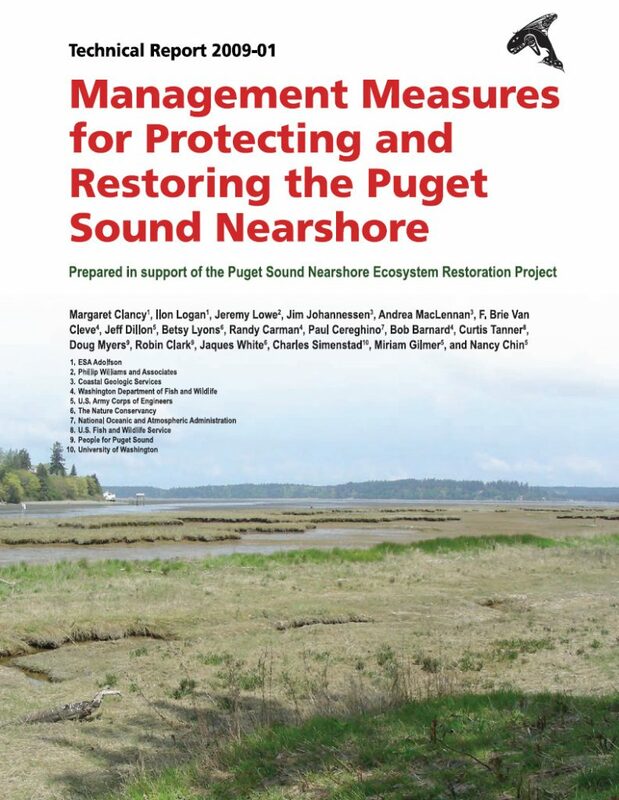 Management Measures for Protecting and Restoring the Puget Sound Nearshore – Experts in Puget Sound coastal processes, management, and cost-effective design since 1993. This project was a collaborative effort with ESA Adolfson, Philip Williams and Associates and Coastal Geologic Services for the Washington Department of Fish and Wildlife (WDFW) as part of the larger Puget Sound Nearshore Ecosystem Restoration Project (PSNERP). The Management Measures report was comprised of overviews of 21 different management measures used in large-scale restoration efforts to provide common understanding among practitioners, aid in future planning, project scoping, identify benefits and constraints, and provide guidance for assessing feasibility and project design/implementation. Coastal Geologic Services was tasked with writing chapters on (MM1) Armor Removal and/or Modification, (MM2) Beach Nourishment, (MM10) Large Wood Placement and (MM17) Species Habitat Enhancement (MM17 was co-written with ESA-Adolfson). View the report here.